This week begins my first week of no school which means that I have lots of time to dedicate to the site. Not only does that equate to more content, and improvements to the site, but we will be able to prepare for our upcoming WWDC 2008 coverage. Regarding rumors for WWDC, I am in the process of starting a series exploring the possibilities for the WWDC 2008 Jobs keynote. The latest iPhone buzz started late Monday morning, when a new case design from manufacturer XSKN started a buzz with it’s newest iPhone case. The new case, shown below, contains a number of rumored features of the forthcoming second generation iPhone. The current 2.5G iPhone case, pictured above. 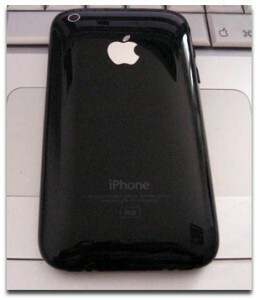 The 3G iPhone case, with rumored features highlighted. You can see that the new case features a curvier, rounded back; what appears to be a change in the mounting of the headphone jack and an unprotected area around the top earpiece area- presumably for a front facing camera (for video-conferencing). Note that after the release, the XSKN website has been hit hard with traffic, rendering it almost unusable. As rumors of an iPhone model refresh build, Swiss newspaper Le Matin published a report claiming the new model would be coming to Swiss mobile network SwissCom and would support videoconferencing, mobile TV and GPS features. This report was shortly followed by a press conference from SwissCom confirming that they plan on bringing the iPhone to their network in the near future. Apple is expected to announce their new iPhone model at WWDC in June.